Scotty’s game changing MANTICORE has been at the forefront of a re-education about guitar pedals and has truly made its mark on the guitar world by setting a whole new standard for overdrives in the market across the globe. Since its explosive release in 2017, Scotty has been determined to make his trend setting pedal even greater and, after months of tireless effort and development, the newly evolved MANTICORE version 2 is finally ready to be released and is primed to set a whole new standard for overdrives World-Wide. MANTICORE version 2 is even more unique and tonefully versatile than ever before. It has been equipped with a broader dynamic range and gain structure that allows the player to finely tune the pedals voice and gain to suit their needs. 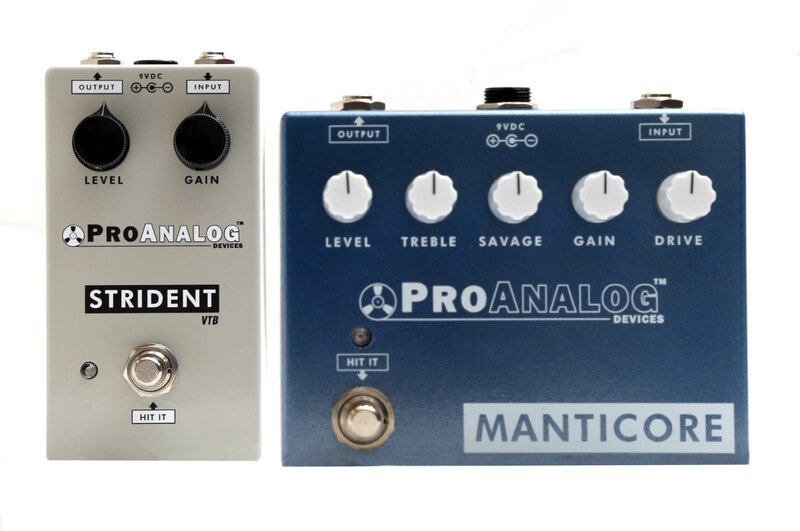 MANTICORE version 2 can do it all from an always on lush and sparkling amp enhancer to an enormous and tonesome clean boost. With the Gain and Savage controls engaged, this harmonically rich overdrive turns into a weapon of rock delivering crunchy rhythm tones, smooth lead tones and even raging Metal tones without sacrificing clarity and touch response. The complex and rich overtones within the pedal allows the player to easily generate harmonics from the 2nd, 3rd and 5th making their guitar and amp sing smoothly into sustained and controlled feedback. OEM electronic true bypass soft switching circuitry design. A new control called Savage which is a unique low pass filter / bass control that adds gain, punch and fattens up your guitar signal as though you just plugged into a 4X12 cab! It's called Savage because when you dime it, it RAGES! Treble A dynamic treble circuit that boosts/cuts treble, and also adds/subtracts gain. Savage A unique Low Pass filter/Bass control that fattens up your guitar tone and adds gain. Gain This is the overdrive control, which lets you dial in the amount of clipping from the overdrive section of the circuit and is more mid-upper mid EQ focused. Drive An input clean boost stage control that drives 3 active filter networks, including treble, high-mids, and lows. Using this control, you can dial in a clean boost tone that enhances the sound of your amp. Copper Gold - Shimmering Silver - Metallic Blue - Dark Green. beyond repair and will void all warranties. "DO NOT PLUG 12VDC OR 18VDC POWER SUPPLIES INTO MANTICORE VERSION 2!" Please check your power supply to ensure you have the right power requirements prior to operation.